Dale Earnhardt Sr. had won many races, but never the Daytona 500. That is, until Feb. 15, 1998 and the day after he first met six year old Wessa Miller. Wessa suffers from Spina Bifida, a disabling birth defect that can lead to a variety of disheartening and life-shortening conditions. Wessa had a dream of meeting Earnhardt and that dream came true through the Make-A-Wish Foundation®. During their meeting, Wessa gave Earnhardt a lucky penny. Earnhardt had many years of success at Daytona. He made 10 top-five and 14 top-10 finishes, including four second-place finishes in the previous 19 attempts. However, the number one spot was elusive. A little luck in the form of a penny and accompanying good wishes from a child is perhaps exactly what he needed. Earnhardt’s public relations agent, J.R. Rhodes, remembers Wessa and penny. 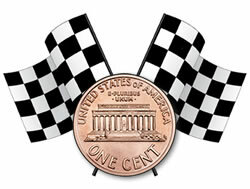 On the 20th attempt and with the lucky penny, Earnhardt earned the checkered flag and came away with the win. Earnhardt’s car, with its penny still inside, is on display with a photo of their first meeting at the Richard Childress Racing Museum in North Carolina. For an interesting and thoughtful article, including details about Earnhardt’s later generosity and meetings with Wessa, read the included David Poole article, Dale Earnhardt Sr. and his lucky penny. Wessa Miller’s amazing story of courage and faith is also a lead chapter in the critically acclaimed book, THE WEEKEND STARTS ON WEDNESDAY: True Stories of Remarkable NASCAR Fans (Motorbooks, 2010).